Kenneth Eldon Worthington died Thursday morning, September 13, at his home. He was born on September 18, 1930, in Longdale, Oklahoma to Joseph Clarence Worthington and Helen Cross Worthington. He spent his youth in Oklahoma and in Kansas, where he graduated from Girard (KS) High School. He served in the U.S. Air Force and then entered Pittsburg State University where he received a Bachelor of Science degree. His career was spent in the aerospace industry working for Boeing Company, where he helped develop the Saturn V Stage I Booster Rocket which was used to launch the manned Apollo missions. He worked for Chrysler and later Martin Marietta Corporation (now Lockheed Martin) where he helped to develop the external tank for the Space Shuttle. Ken was active in his community while living in Slidell, Louisiana, where he served as president of Slidell Little Theatre and won three acting awards and two directing awards. He also helped found the Slidell Art Association. In Lexington he planned and organized planting of the downtown Lexington flower barrels; he was instrumental in obtaining the period benches and trash containers downtown, as well as the period streetlights. He was chairman of the Lexington Pride program which offers low-interest loans to refurbish facades on downtown buildings. 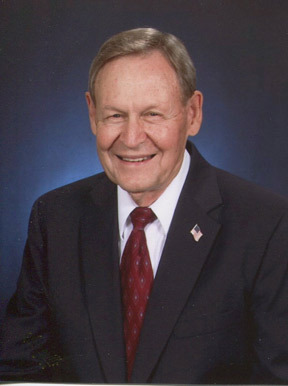 He served as President of the Lexington Parks & Recreation board; was a member of Lexington United Methodist Church, a past president of the Anderson House Foundation and the Lexington Community Betterment Association. He served on the board of directors of Boatmen’s Bank, Lexington Chamber of Commerce, Machpelah Cemetery Board, and was a member of Lexington Rotary Club, Lexington Methodist Men, and Lexington Historical Association. He reorganized and obtained a new charter for the Lafayette County Red Cross Chapter, and was chosen Chapter Manager of the Year for the state of Missouri by the American Red Cross in 1993. He was a charter member of the Live In Lexington Concert Series, and a member of the American Legion Post 60. He is survived by his wife Susan Shea Worthington; three sons: Gregory Joseph Worthington, Bradley Daniel Worthington and wife Tami, Paul Riley Worthington and wife Laura; one daughter: Roberta Kena Fanoele and husband Mark; two stepchildren: Sheila Shea Chimento and husband Jim and Dennis Kendall Hinman and wife Lorrie. He is also survived by 12 grandchildren, three great-grandchildren, four step-grandchildren, five step-great-grandchildren and a brother George William Cross and wife Kay.